Kingdom Rise: Redefining a Life of Worship and Justice is a creative and powerful new worship resource aimed at engaging both individuals and the church to live as agents of change for the Kingdom of God. This four-session study will challenge your views of worship, and leave you never again satisfied with the status quo of merely viewing worship as something that happens in church for an hour a week – but rather a radical life change that empowers and unleashes God's people to live on earth as it is in heaven. Designed to be used as a personal or small group study, Kingdom Rise, is paired with four gripping short films that enhance the learning experience - taking you or your group to a deeper level of understanding and impact. The complete Kingdom Rise worship resource includes this four-session study combined with four short films, and the Kingdom Rise worship album - with songs written that go hand in hand with each session of the study. For the complete experience, be sure to pick up the Kingdom Rise worship album along with this teaching resource. 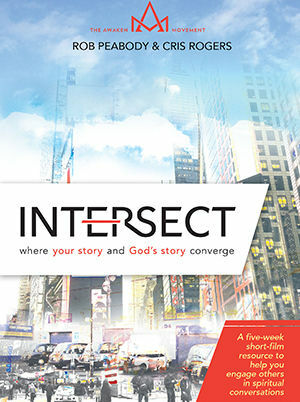 A five week short-film resource to help you engage others in spiritual conversations, Intersect uses the creative medium of video storytelling to start and facilitate discussions about where your story and God's story converge. Follow the journey of five individuals as they tell authentic stories of circumstances that have forced them to examine how God might fit into their lives.